from Little Rock Arkansas is an accomplished musician who first started playing the flute at the age of 11, and now performs on both flute and mountain dulcimer. As a flutist, she played with the Arkansas Symphony, and was a flute major in college with the intention of teaching music. After marriage and three children, her music was put on the back burner for about twenty years. And then she discovered the dulcimer! 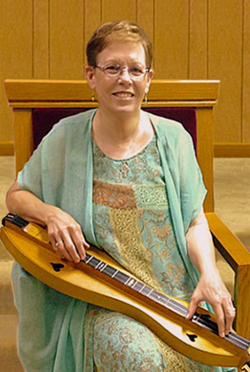 After much practice and many competitions, she won the Southern Regional Dulcimer Championship in 1999 and was the first woman to win the National Mountain Dulcimer Championship in 2001. Since then, she has taught at venues across the country including Western Carolina University, Dulcimerville, Buckeye, Unicoi, Summer Solstice in California, Mountain View, Melodies & Musings, Kentucky Music Week, and many more. 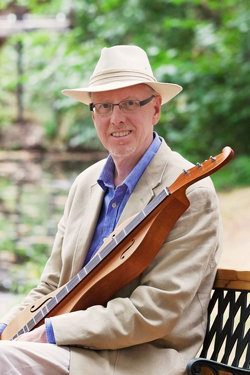 Hailing from Olney, England (the home of Amazing Grace), Dan Evans is the leading (and only professional) British dulcimer player and considered to be a hugely accomplished, stylish and innovative guitarist. To date his record company (DanSing Music) has released 5 CD albums of Dan's music and he has undertaken 15 international tours. Dan’s CD albums enjoy international distribution and have sold several thousand copies to date. They feature leading international musicians in the classical and jazz genres, are recorded to the highest professional production values and have received glowing international reviews - they look good too ! His music tours have taken him to France, Ireland and many parts of America, winning Dan the respect of many of the leading players in his genre as well as the hearts of audiences on both sides of the Atlantic.